We love potato packets! You can throw these babies on the grill or in the oven, and you can flavor them in so many ways. They go with anything from hamburgers, chops, chicken, bbq or steak. What I love is the clean-up is a breeze! I generally put each serving in a separate packet. They tend to cook better and I can flavor them according to each person’s tastes. I say serving because if a potato is very large, it could be two servings or if it’s small, you may cut up two for a serving. I started by scrubbing the skins of a couple russet potatoes clean. You can use any kind of potato that you like. I have used russets and red new potatoes or even sweet potatoes. I am not sure if the Yukon golds would hold up as well, but feel free to give them a try if that is what you prefer. Slice uniformly between 1/8″ and 1/4″. Spray pieces of foil with non-stick cooking spray. Fan out sliced potatoes across the center of each piece of foil. Either spray the top of the potato with non-stick cooking spray or dot with pats of butter. This will assure that your goodies will stick to the potato and not the foil. Salt and pepper. My hubby likes lots of goodies. 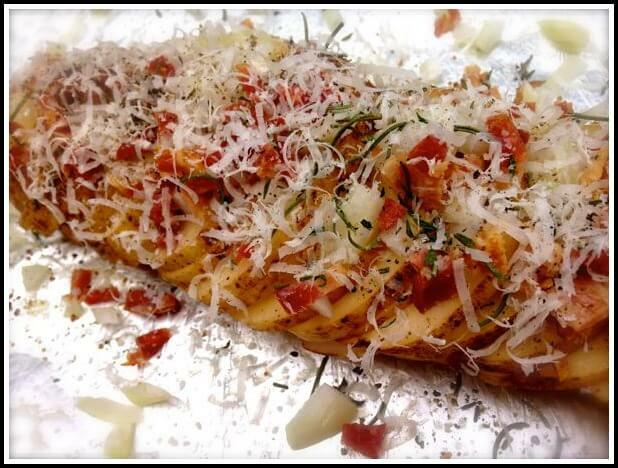 For his packet I salt and peppered the potato and then piled on onion, bacon, rosemary, thyme, and finished it off with parmigiana reggiano. For mine, I left off the bacon and the cheese. You could add any addition of meat such as pancetta, pepperoni or ham and/or veggies such as green pepper, jalapeno or zucchini. Just make sure that they are sliced in similar size so they bake at the same rate. Once dressed, fold up the long sides up to the center and then fold up the ends. Bake at 350°F for 20 to 30 minutes or grill for the same amount of time. Be careful when opening the packets. The steam is hot! Tear off a piece of foil for each serving, and spray with non-stick cooking spray. Scrub potatoes clean and cut into 1/8" to 1/4" slices. Fan potatoes onto foil. Spray the potato with non-stick cooking spray or put pats of butter across potato. 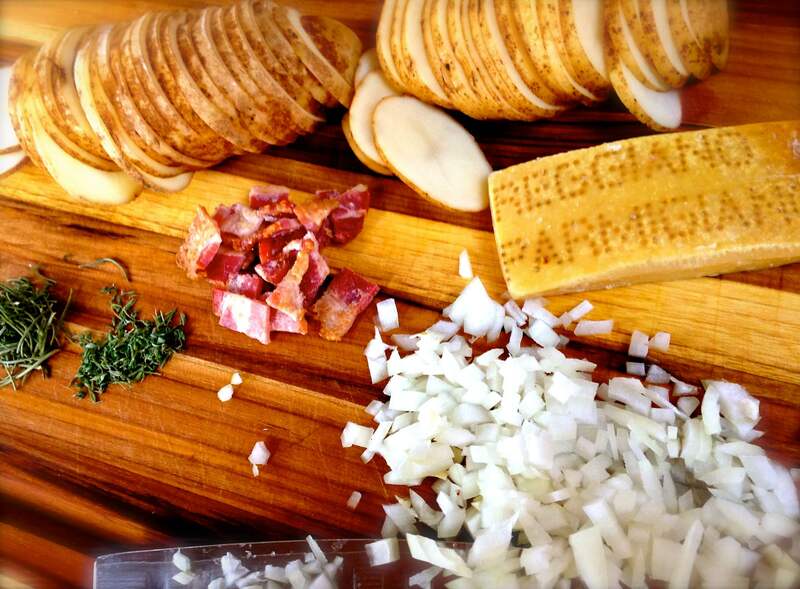 Cover with meat, cheeses, vegetables and herbs of your choice. Wrap foil up over the middle and fold up ends to seal. Bake at 350°F for 20 to 30 minutes or grill for the same amount of time. Be careful opening the packet. The steam will be hot! We love them. You can put about any thing in there! 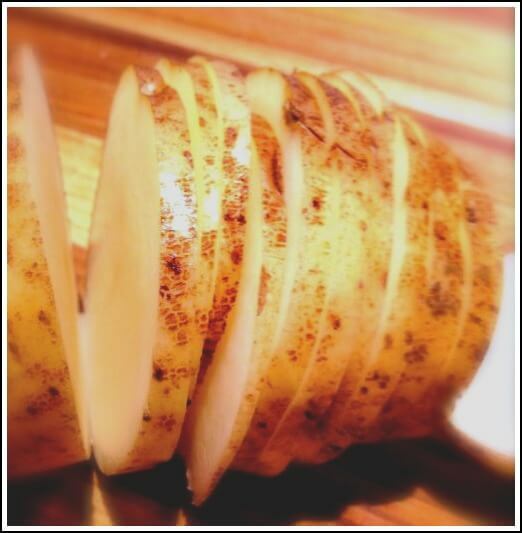 I love all things potato, so this will be made this week. Love the recipe, thank you. Me too! Thanks for taking the time to comment. I am always wondering what people like. Let me know what you think. Thanks for the picture compliment! This seems so simple and looks so delicious. I’m really excited to try this out on the grill- Thanks for the delightful idea! Let me know how it comes out. Thanks for visiting Adelie!